City Executive Club is an exclusive invitational lifestyle club, specifically established to enrich the lives of a diverse group of discerning individuals. By working closely with a range of carefully selected partners we can offer some unique experiences, preferential treatment and rates on an extensive range of products, services and events. We are confident if you are using the benefits of the club you will easily recover the cost of membership and gain a lot more. Membership requires a proposer and seconder to ensure we retain the high standards of etiquette that allows us privileged access to the most exclusive events and partners. You are also able to apply directly and attend events as a guest should you wish to join without knowing an existing club member. To sign up please complete the Direct Debit application on this link. Members have access to all our partners and events through our smart phone App. 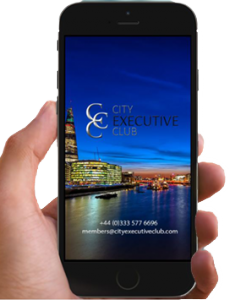 City Executive Club draws on its unrivalled network of industry contacts and valuable experience to bring unique opportunities to experience and enjoy a calendar of rich and varied events. Once a quarter we are holding our CEC social event, which is hosted by the club directors. Each event is different and provides a forum where members and their guests have a chance to experience an evening of entertainment, whilst catching up on the latest club developments and meeting some of our premier partners. We are always looking for new partners to offer services, events and new experiences to members and guests of the club. If your business offers a product or service you think our members may be interested in, then please get in touch.